Does my engine revert to stock when the Unichip is removed? Sensors are each designed to detect and report to the OEM ECU specific conditions and do so by generating a unique electrical signal for each unique engine condition. With the Unichip installed, the sensors accurately detect the actual condition it’s designed to observe and sends the appropriate signal to the ECU. After the signals are sent out of the sensors, they enter the Unichip which is installed electrically between the sensors and the OEM ECU. 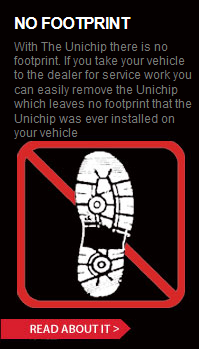 The Unichip very specifically makes changes to the signals and then passes them on to the OEM ECU. Even with the Unichip installed, all of the sensors are completely stock and perform as designed. The OEM ECU, also bone stock, receives not the signal sent by the sensors but the ones modified by the Unichip so its perception of what’s happening in the engine is slightly “erroneous” The OEM ECU goes to the site in its control map based upon the Unichip changes signal rather than the site determined by the original sensor signal. Although the changes are typically small, this “erroneous” map site is the correct site for the data received by the OEM ECU and, as such, the OEM ECU is both stock and responding correctly. Even with the Unichip installed, the OEM ECU is completely stock and performs as designed.